Add a warm luster to casual and elegant ensembles with this simple Tin-cup necklace jewelry set. 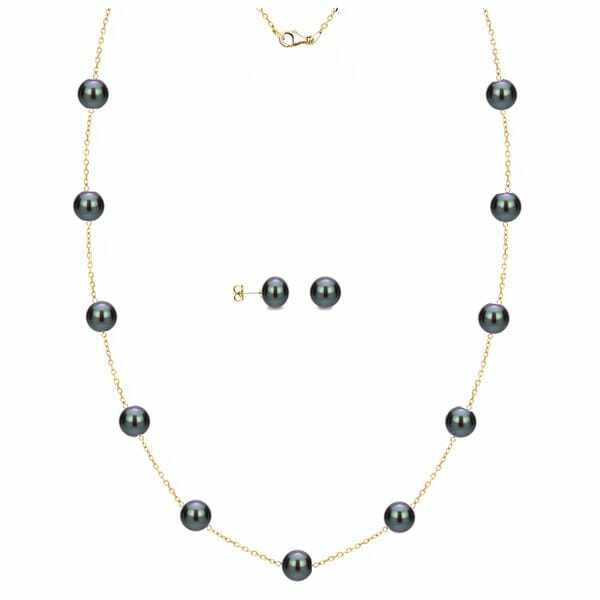 11 Pieces of Black cultured freshwater pearls form stations along 18k Yellow Gold over .925 Sterling Silver 18-inch length cable chain, creating a blushed glow that illuminates the neckline. A Lobster-claw clasp secures the chain, while the Matching Button-shape Stud Earrings Complement the Perfect gift set for yourself or for the Special someone. A perfect gift for your mom, spouse, sister, best friend, for Back to School, Holiday, Birthday, and she is surely will love and appreciate this beautiful jewelry set. The set are available with pearls in a variety of sizes, so you can choose the style that's right for you. DaVonna 18k yellow gold over Sterling Silver 9-10mm Multi-Color Freshwater Pearl Lariat Y Necklace 17"
DaVonna 14k Yellow Gold Black Freshwater Pearl Pendant Necklace, 18"